I had butterflies the size of albatrosses in my stomach as I said farewell to my family at the airport the Sunday before the first ever SourceCon in Europe. I knew that as the only African attending the conference that I would need to pack my A-Game to make friends quickly. For ten years, I have religiously followed previous #SourceCon conferences as it has always been the best platform for me to learn all of the new tips and tricks from the sourcing greats. Towards the end of last year, the FOMO proved too great, and I started motivating to my Boss to send me SourceCon Europe. It was a lot easier for me to attend this SourceCon as it was a shorter flight (only 16 hours of travel!) and Budapest is in the same time zone as Johannesburg so I would not have any jet lag to deal with. My Boss was open to this opportunity as he could see that I did not have any local conferences that I could attend to learn more about sourcing. My next step was to get in touch with the super friendly people at SourceCon which resulted in myself and Shannon Pritchett having a great Skype chat. This was incredibly helpful as she told me that if I could get six blogs published by SourceCon; I could buy myself a free ticket to the conference. When your currency is the South African Rand, this is a no-brainer, and I started blogging immediately! Six published blogs and an airline ticket gripped in my sweaty palm later; I was on my way to Budapest, via Istanbul, on Turkish Airlines. The journey was long, but I must admit that my excitement started to supersede my nervousness as I got closer to Budapest. I made it to the Marriott Hotel on the banks of the beautiful Danube river with just enough time to shower and head to the preconference Welcome Wagon Meeting. I had no idea what the Welcome Wagon was when I happily agreed to be a part of it. I just figured that it couldn’t be too complicated a job and as I was on my own, it would be an excellent way to meet new people. Am I ever grateful that I made this decision! From the first Welcome Wagon meeting, I knew that I had found kindred spirits and these people would soon become my SourceCon family. I cannot thank the following people enough for their warm greeting and for taking me under their wing: Shannon, Kate, Amy, Vu, AmyBeth, Angie, Ronnie, Sjamilla, Adriaan, Jim, Marcel, Tris, Maisha, Iker, Mark, Holly, Kasia and Balazs (in no particular order). I spent the Monday afternoon before the conference started, meeting and greeting people arriving at the conference. The delegates were so great, and I could see that they were impressed with the warm welcome that myself and my fellow Welcome Wagon members gave them. (It did get a bit weird when trying to determine shirt sizes and looking people’s torsos up and down to assess the best size to give them!) This was a fabulous way to meet a lot of people in a short space of time, and I recommend joining the Welcome Wagon to anyone who is attending the conference on their own. The conference took place over two days, and I learned more in these two days about sourcing than I had managed to learn in my 40-odd years on this planet. I took copious notes, and I still have a ridiculous number of tools and chrome extensions to test out. 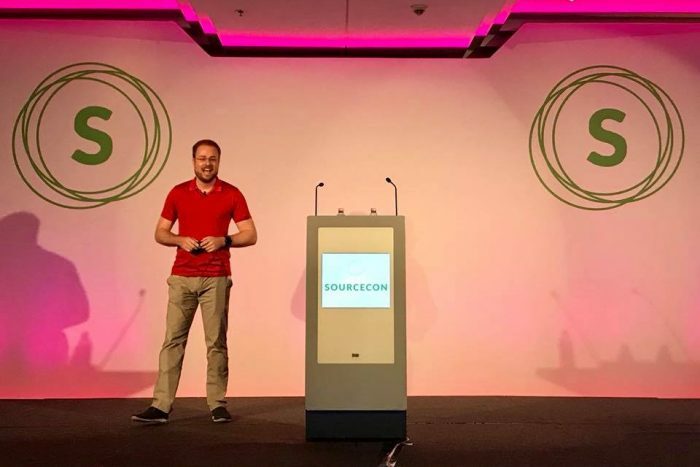 I cannot fault any of the speakers, and everyone who presented had several valuable tips to share with the SourceCon community – I appreciated this. As we also know, at these conferences, the best networking happens after hours and between sessions. I had the best conversations with people from all over the world with oodles of sourcing experience. At some points, I had to pinch myself that I was sitting at dinner having a beer with the likes of Katrina Collier and Jim Stroud. This happened more than once and with several difference sourcing greats who I have followed on Twitter for years! When I set off from South Africa, I made sure that I had several business cards with me to hand out to my fellow conference attendees. I ended up handing out ONE business card, and it was to a vendor in the exhibition hall. I guess when you are at a sourcing conference, people know they will be able to find you if they want to stay in touch with you. This will not be my last SourceCon event. I will move heaven and earth to attend another SourceCon event as soon as possible. I big shout out to all the attendees who were all super friendly and made my first SourceCon conference as super as it was. Thank goodness I found such wonderful, like-minded individuals as I was beginning to think that I was the anomaly! Vanessa is determined to bring the ‘Human Element’ back into today’s Recruitment Process. She believes that people are the core building blocks of every business but that doesn’t mean that we can treat every ‘block’ the same. Vanessa has over 10 years’ experience in the Recruitment Industry and has specialized in the IT Applications space for most of this time. Before starting her career in Recruitment, she taught unruly children in London; operated a chairlift in the USA and taught people to Scuba Dive in SE Asia. She has recently moved into the Internal Recruiting space to focus on her latest passion for Employer Branding; Talent Attraction and Social Media Marketing. Vanessa loves presenting about these topics and sharing her knowledge, and experiences, with others. Vanessa’s non-profit Side Hustle is co-hosting South Africa’s longest running Twitter Chat, #JobAdviceSA. This is a weekly chat that has helped several Youth to put a CV together; to interview better and to find jobs. Vanessa’s mantra is “Life is too short to work in boring jobs….” The same attitude can be applied to the way she has lived her life and how she tackles each day. Should a Company Use a Sourcer or a Researcher?